In March, 1862, the founding of the Capitoline Club was announced. This club, an outgrowth of the K.N. Skating Club, announced its intention to be a musical, literary, skating, and base ball club all at once. A skating pond, said to be twice as large as the next best in Brooklyn, was secured in due course. This was the Capitoline Pond. The Capitoline Base Ball Grounds were conceived in 1863 as a rival to the immediately successful Union Grounds of a year earlier. A plan to drain the Capitoline pond for base ball purposes failed to take shape, however, and waited until 1864. In April of that year, the proprieters, Messrs. Weed and Decker offered the powerful Atlantic Club a free lease at their new park, and the club could scarcely refuse. 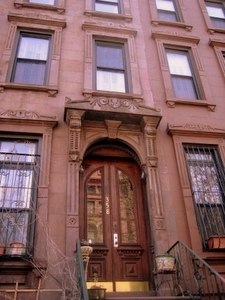 The Capitoline grounds stood in Bedford, in a block bounded by Halsey Street, and Marcy, Putnam and Nostrand Avenues. On the Putnam Avenue side, there were stables and buildings with a restaurant, private rooms, sittings rooms, a bandstand, dressing rooms, and so on. Bleachers along the Halsey Street and Nostrand Avenue sides held 5,000 spectators. The entrance was on Nostrand Avenue, 200 feet south of Putnam. In the 1870s, the ground was divided into two fields for base ball matches. Regular games took place on the upper ground, and junior matches on the lower ground. On May 5, the first match at the Capitoline Grounds saw the Atlantic Club defeat a field nine chosen by Henry Chadwick from players of other Brooklyn clubs who attended on the day, 45 to 11. The first proper club match was not any better- Atlantic defeated Nassau of Princeton 42 to 7. The Enterprise Club also called Capitoline home in 1864, and Excelsior moved there in 1866. Both were enemies of the Atlantic Club, and refused to play them, but they played a number of matches together, both between their best nines and their "muffin" nines of club novices. The Atlantic's first two seasons at the Capitoline Grounds were the finest in the club's proud history, seeing not a single defeat. On July 27, 1865, the Atlantics hosted the Empire Club of New York, and laid on a demonstration of dominance unparallelled at the Capitoline Grounds. Tommy Pratt's excellent pitching, holding the Empires to just three runs, was overshadowed by an awesome exhibition of hitting, with the Atlantics scoring 65 tallies. Ten of those were credited to first baseman Joe Start. The system of which I disapprove, and I am confident I will be upheld by the majority of players is, that on the field we notice the "slide game," or when a player in an effort to gain his base will throw himself on the ground, feet foremost, sliding for fully a distance of twenty feet. Perhaps it is true that Cuthbert was the first to introduce the slide game to players of Brooklyn and the New York area. The game itself certainly took place, being handsomely won by the Atlantic Club, 33 to 13 in five innings. To be fair, however, the Keystones were likely still suffering the effects of food poisoning from a lobster dinner two nights previous. During the game against the Star Club at the Capitoline Grounds the previous day, Cuthbert was certainly suffering: Cuthbert, a fine fielder, could scarcely run at all. We would not rob the Brooklyn champions of the temporary glory of having beaten these professional experts. It is possible the game was fairly played throughout and honestly contested by the Red Stockings, but this defeat coming after a series of almost unprecedented victories looks much like the old sporting adage of letting up to win. A great deal of money changed hands yesterday, but we doubt if any of the regular backers of the Red Stockings were among the losers. Moreover, it was won by the fairest, staunchest, skillfullest, pluckiest playing on record. "Science and nerve" did the business. Eleven innings, a total score of fifteen, and that standing just eight to seven, tell a story to professional minds which sends the blood tingling in joy to their toes. It was the greatest game ever played between the greatest clubs that ever played and, as usual, when Brooklyn is pitted against the universe, the universe is number two. Yesterday at the Capitoline Grounds a large crowd assembled and cheered lustily as a youth from New Haven, Conn., Fred Goldsmith, demonstrated to the satisfaction of all that a baseball could be so manipulated and controlled by throwing it from one given point to another as to make a pronounced arc in space. The test as made by drawing a chalkline on the ground a distance of 45 feet from one extremity to another. An eight-foot pole was then driven in an upright position at one end. Another pole was driven in the same manner half-way between the two end poles, planted directly on the line. Now everything was set for the test. Goldsmith was placed on the left side of the chalkline near the end pole facing the pole at the other end. The purpose of this was that the ball delivered for the thrower's hand was to cross the line, circle the center pole and return to the same side of the line from which it was thrown before reaching the far pole. The feat was successfully accomplished six or eight times, and that which up to this point seemed an optical illusion and against all rules of physics was now an established fact. Holmes sourced the article to the Brooklyn Eagle, August 17, 1870. No such article exists in that issue, however, and at the time Chadwick was a writer for the New York Daily Tribune. For that matter, Goldsmith was just 14 years old. Scholars continue to search for the true source of this story, which has not been found in any contemporary newspaper that survives. Sadly we must cast our lot in with the theory that the article was created ex nihilo by Goldsmith or someone close to him. When baseball season was over each year, a city main at the corner of Halsey and Nostrand was opened, and the grounds were flooded for skating. This also meant base ball on skates, when that pastime was in vogue, mainly until 1868. On January 11, 1871, a special match was held, the first in three years at the Capitoline, to commemorate the passing of an era in base ball. The Atlantic Club, featuring six members of the famous old nine from 1870 before they went their separate ways, defeated a similar remnant Mutual team, 35 to 6. When the water was drained from the field in Spring, P.T. Barnum's circus would take the grounds, to great fanfare, and after the circus played its run, baseball would begin again. The only season of major league baseball at the Capitoline Grounds was in 1872. The Atlantic Club, then of the National Association, won the final major league game there 6 to 3 over Boston, but left for the Union Grounds in 1873. The Capitoline Grounds continued to host lesser matches, and of course the circus. 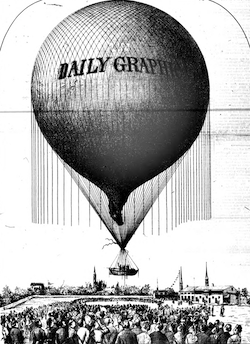 There was also Professor Washington Donaldson's disastrous attempt, sponsored by the Daily Graphic, to launch the hot air balloon Graphic and cross the Atlantic, in October of 1873. After several attempts which failed completely, including one balloon exploding on the ground, and a successful test flight in the smaller Magenta, a launch finally took place on October 6, witnessed by a crowd of 500 spectators. The Graphic never reached any great height and crashed in Connecticut during a severe storm, fatally wounding one of Donaldson's companions. 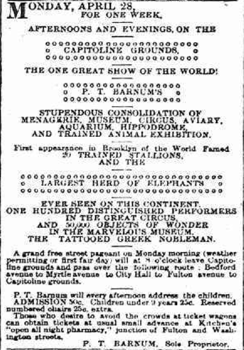 The Eagle's editors were not in a complimentary mood: In the annals of humbug, this balloon business should take a superior place, even to the numerous contributions of Mr. Barnum to the history of fraud. Donaldson himself died in 1875 when another of his balloons fell into Lake Michigan. The last baseball game we can find reference to was a visit of the Hopkins Grammar School of New Haven, who defeated Brooklyn Polytechnic 4 to 3 on June 16, 1879. The Eagle reported that "attendance was small, as few but the players knew anything about the match being played." In 1880 the Capitoline Grounds were demolished, and two streets extended through the block. 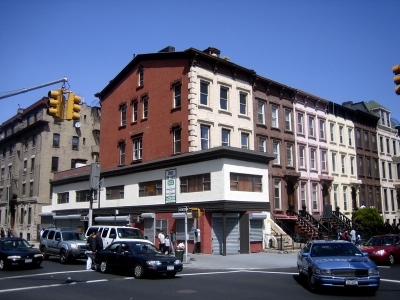 The resulting housing development still stands in the Bedford-Stuyvesant neighborhood.